Nablus, approximately 63 kilometers north of Jerusalem, is the second largest city in the West Bank. It is a thriving industrial and trade center full of archeological sites and ruins in varying stages of excavation. Visitors have been particularly enthralled with the Roman Theater near the heart of the city. It has a steady stream of visitors throughout the year. Nablus is known around the world for its exquisite olives, olive oil. In the Old City, one can wonder for hours through the market. Nablus is known for its appetizing sweets. 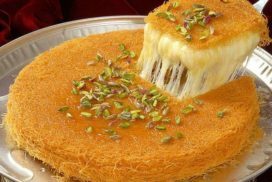 Sampling Kanafeh, made from a delicate combination of melted cheese, shredded grain, and sugary honey sauce, is a must for any visitor to Nablus. Another significant site is Jacob’s Well, 2 kilometers east of Nablus by the village of Balata. It is the site where Jesus is said to have asked a Samaritan woman to draw water from a well for him. Today Jacob’s Well is located in a Greek Orthodox monastery and is open to the public. Nablus has a Samaritian Quarter west of town. The Samaritans history dates back to 721 B.C.E. Samaritans follow the Torah but they differ from northern Judaism about the sites of Abraham’s sacrifice of Isaac and Joshua’s altar. Samaritans have identified sites on Mount Gerzim in the Nablus region as the locations for these events. Soap in Nablus has been made for years from soda and olive oil. 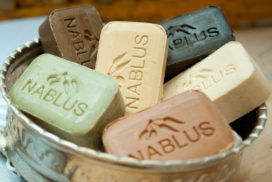 Although the manufacturing methods have changed slightly over the years, soap made in Nablus is still renowned for its purity and is exported throughout markets in the Middle East. Several traditional soap factories in Nablus offer tours of their soap making process. Of particular interest is one of the city’s recently restored Turkish Baths. The tradition of baths is ancient and has its origin in Roman times. At the beginning of the nineteenth century, an important part of Nablus’s social life revolved around its public baths (hammams). Today, two public renovated baths carry on the tradition. They provide an opportunity for a unique moment of escape and of well-being. In both hammams, bathers can prolong an agreeable moment with inexpensive refreshments and a smoke on a water-pipe. 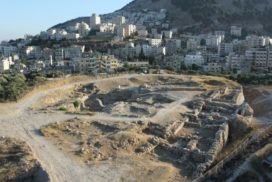 Located 3 kilometers east of Nablus, Tell Balata, or Shechem, was one of the earliest and most powerful Canaanite cities. Destroyed and rebuilt several times, the ruins of this ancient city occupy a hill rising 525 meters above sea level. A fortress temple on the summit of the hill is the largest and most impressive surviving Canaanite temple in Palestine. Other visible ruins include two monumental gates, massive city walls, and a governor’s palace with a small private temple, a guardrooms, an assembly, living quarters and a kitchen. The ancient royal city of Sebastia, or Samaria, is one of the largest archeological sites in Palestine. Located 12km northwest of Nablus, the ruins of ancient Sebastia extend on a hill overlooking the present village of Sebastia. 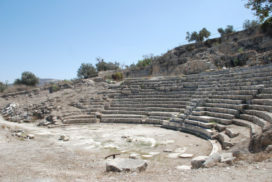 Excavations at Sebastia indicate that it was first inhabited during the Chalcolithic period in 4000 BC. It did not gain political importance, however, until king Omri built his royal city there and named it Samaria. The visible remains at ancient Sebastia include Roman tombs, a Hellenistic tower, a Severan basilica and Herodion gate towers at the entrance of a colonnaded street with 600 columns on both sides. According to religious tradition, the head of John the Baptist was found in Sebastia and a Crusader church, later converted to a mosque, was built in his honor. Tell Taannek is a peer-shaped mound of approximately 14 acres, found at 178 meters above sea level. 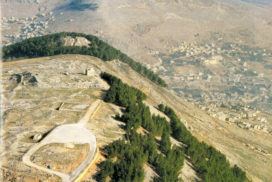 The site is located at the northern end of the Nablus ridge and at the southern edge of Marj Ibn Amer, eight kilometers south of Tell el-Mutesellim (Megiddo). The site occupies a strategic location on the fringe between the mountainous area and the plain, on the main route between JENIN and HAIFA and west of the historical pass, Wadi Hassan, and east of el-Yamoun. The modern Palestinian village Taannek, located on the southeastern slope of the tell, still bears the ancient name “Taannek”, indicating the historical continuity of the name. The name was probably mentioned around 1350 B.C. in the Amarna letters. Taannek was mentioned as a captured city in the topographical list of Thutmose III’s military campaign into Asia in 1468 B.C. It was subordinate to the Egyptian ruler residing in Megiddo, as evident from Taannek letters 5-6, but still remained an independent city-stake (Glock, 1983). The city was captured again by Shishak I in 918 B.C. during his campaign in Palestine. The site was mentioned several times in the Bible as a Canaanite town undefeated by Joshua. Later Taannek was mentioned as a large village in the 4th century A.D. by Eusebius and in the Crusader records from the Middle Ages. The northern districts of Jenin, Tulkarem, and Qalqilya, which are located on the fringe of the central mountainous ridge and the coastal plain to the west ant the Marj Ibn Amer (Plain of Jezreel) to the north, represent the central zone of Palestine. The area played an important role in the past as a crossroads between the sea and the northern region. The historical Via Maris passed through this area as well as other internal routes that connected the mountainous areas to the coast. Hundreds of archaeological sites and features are contained within the region. The excavated sites (Tell Taannek, Tell Jenin, Khirbet Bal’ama, Tell Dothan, Khirbet es-Samra, and Wadi Qana) provide information about the cultural history, ranging from the prehistoric period to modern times. The area is distinguished by its cultural and natural landscape, a combination of hilly areas and a plain. The diversity of these areas is represented by the wide range of its agricultural produce: olives, almonds, figs and citrus. Khirbet Bal’ama is located at the southern entrance of Jenin, approximately two kilometers south of the main center of the city. The site was a Canaanite fortified city that occupied a strategic position commanding the historic route of Wadi Bal’ama and linking Arraba Plain with Marj Ibn Amer. The site is identified with ancient Ibleam mentioned in the Egyptian Royal Archive in the 15th century B.C. During the classical period it was known as Belmont, and in the medieval period as Castellum Beleismum. The tunnel consists of three parts, the archway at the lowest entrance, the rock-cut tunnel going upwards to the west, and the upper, partly built narrow passage. The total length that has been explored is 115 meters, with 105 meters being rock cut, including 57 steps. Recent joint excavations led to the finding of pottery vessels, metal objects, glass objects, coins and a few inscriptions. These findings indicated a presence of civilization from the Bronze Age, Iron Age, and Persian Hellenistic, Roman, Umayyad. Crusader/Ayyubid, Mamluk and Ottoman periods. The village of Burqin lies about five kilometers west of Jenin, at the northern end of the Arraba plain. The village was mentioned in several historical sources. In the 16th century it was described as a small village. Archaeological surveys in Burqin have revealed evidence of remains from the Early Bronze Age, Middle Bronze Age, Late Bronze Age, Iron Age, and Roman, Byzantine, Ummayad, Ayyubid, Mamluk and early Ottoman periods. 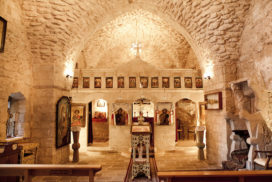 St. George Church is located on the northern slope of the historic core of the village, overlooking Wadi Burqin. It belongs to the Greek Orthodox community. The church is dedicated to St. George (Al-Khader), the most popular saint among Christians and Muslims. 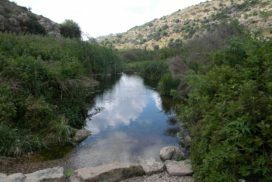 Tell Dothan is located on the eastern side of the Arraba plain, approximately eight kilometers north of Jenin, one kilometer east of the Nablus-Jenin road, amid a fertile plain and perennial spring at the southern foot of the tell. A cave was found in 1980 in Wadi Qana. It consists of a network of natural caves. Excavations in the cave indicated remains from the Neolithic and Chalcolithic periods, and the Early Bronze Age. The cave was used as a burial place. Many discoveries have been made at the site such as pottery, flint, stone, ivory, and bone objects. Neolithic remains were found in all parts of the cave and consist of pottery vessels of the Yarmukian culture. The bulk of the objects dates to the Chalcolithic period and consists of pottery, basalt, metal, bone, ivory jewelry, and human skeletal remains. The most distinctive find of this period is represented by its metal objects that consist of copper objects and, for the first time, electrum and gold objects. Eight electrum and gold objects were found in the cave. The gold and electrum of Wadi Qana represent so far the earliest known production of this precious metal in Palestine.